Choose from 2 hotels and guest houses in Hornchurch. Shown below a just a selection of the hotels available. To search within an area please use the menu on the right. In the heart of the town centre, less than 750 metres from Romford Railway Station, the hotel offers great value, with free parking and spacious, comfortable and modern en suite rooms. 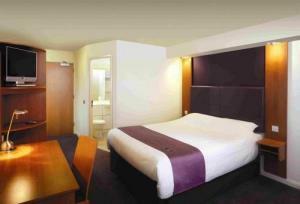 The Premier Inn Romford Central is close to all of the town's shops and bars. Trains run regularly from Romford Station to London Liverpool Street. The A12 and M25 are also within easy reach. All of the rooms have satellite TV, hairdryers, tea/coffee making facilities and telephone/modem points. Some rooms can take 2 adults and up to 2 children (under 16 years). The 2 children also get a free full breakfast when accompanied by an adult eating a full breakfast. An all-you-can-eat buffet breakfast is available each morning and includes the expected cooked items such as scrambled, fried, poached or boiled eggs, and pork or vegetarian sausages. There is also a wide continental selection. The on-site Table Table restaurant offers a fresh new twist on eating out.